Sometimes I see produce that stops me in my tracks. Fresh vegetables or fruit that is so perfect and begging to be eaten that I cannot help myself. These carrots were just such a moment. These babies basically jumped into my bag when I saw them and then the story behind them made it even better. 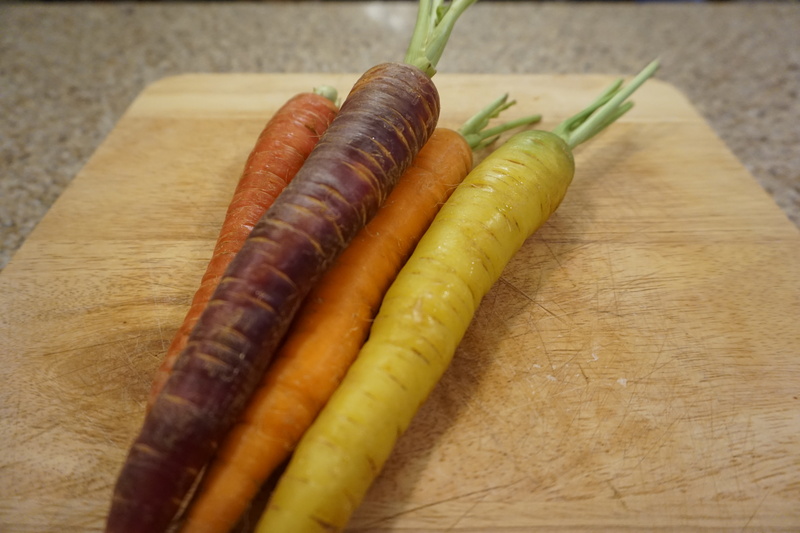 These carrots and other produce are sold by Brainfood Homegrown at Union Market in DC. It’s a nonprofit that gets local high school students excited about food and the food service industry through lectures, community service projects, cooking classes and a CSA run by the students. They have a small stall at Union Market and I am embarrassed to say I had never noticed it before until these carrots (a post on my favorite spots at Union Market will be forthcoming). I will now be stopping by there every visit to see what else they have. Anyway once I got them home I realized doing anything to mess with the beautiful natural color and flavor of these would be a sin. So I grabbed my handy peeler and went to work. When produce is this fresh, raw is the way to go and by peeling vegetables you not only make a pretty plate, the thin slivers help make even tough spears of asparagus delicious without any heat. 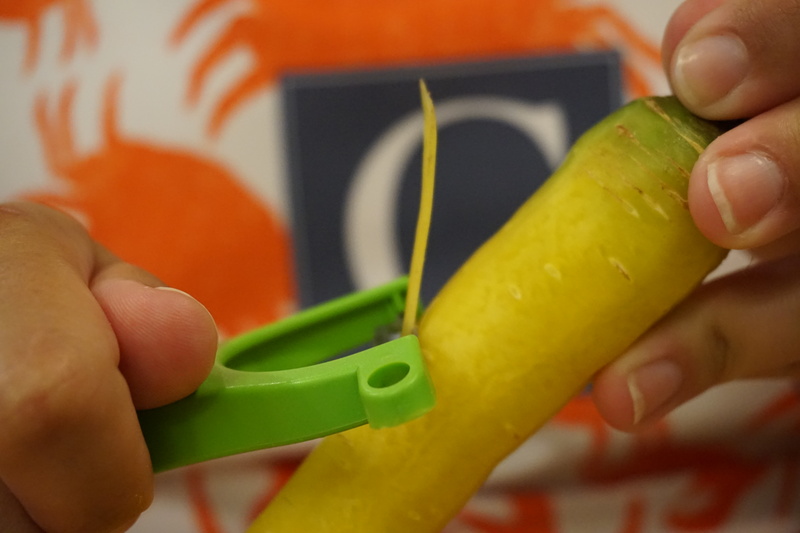 All you have to do is peel off the outer tough layer the way you would normally – toss those. Then just keep peeling and you will get delightful ribbons of carrot (or zucchini, asparagus, the list goes on and on) that you can toss lightly with dressing. I used a light dressing with some fresh tarragon but really just olive oil, vinegar and salt and pepper could work too. These ribbons can also make a great garnish for a larger dish. I cannot wait to see what Brainfood has in store for me next. In a small bowl combine the lemon juice, mustard, tarragon, honey and olive oil with a whisk. Season with salt and pepper. In a larger bowl toss the carrot ribbons with just enough dressing to coat.